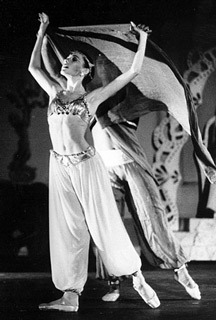 Josie Walsh was featured as Arabian in Westside Ballet’s 1988 production of The Nutcracker. After her Westside Ballet training, she went on to dance with Joffrey Ballet, Zurich Ballet, Oregon Ballet Theatre, and Los Angeles Chamber Ballet. Josie is director and choreographer of “Myo,” an innovative ensemble of dancers, aerialists, actors, opera singers, and rock band performing in her hit show Avalon. She has also been performing in and choreographing a wide range of projects from music videos to fashion shows. Josie returned to dance as a guest artist at Westside Ballet’s 2002 Gala.